It is amazing to think that I have been at the Gold Coast for two weeks now and fully dived into my research internship. Before I get to the whole reason I am in Australia, I want to talk about the wonderful place that is the Gold Coast, where I am living for 10 weeks. If you have never been to Australia, or if you have never really explored Australia and its cities on a map, let me acquaint you with where I am. The Gold Coast is in the middle of the eastern coast of Australia. It is a conglomeration of different suburbs and little towns scattered from the edge of southeastern Queensland up to the outskirts of Brisbane. It would take 10 hours to drive from Sydney to the Gold Coast, and I am a 1-hour drive from the closest big city of Brisbane. To get to the very top of Queensland, the tip of the Cape York Peninsula, I would be driving for 50 hours. My Australian friends had told me beforehand that I was lucky landing an internship here because there was beach as long as the eye could see and many, many sunny days ahead. I have not been disappointed on either of those counts. Within 15 minutes, I can be amongst the skyscrapers of Surfers Paradise or, in 20 minutes, I can be lounging on the calmer beach at Burleigh Heads. 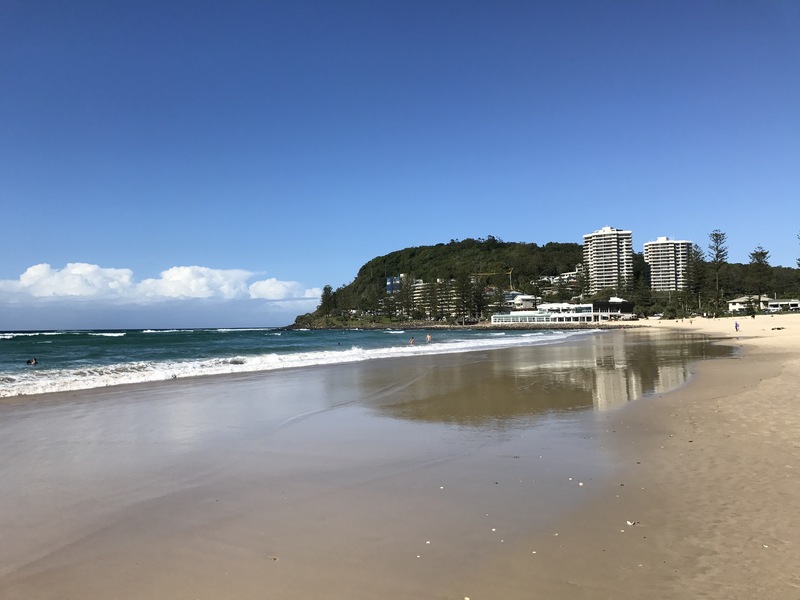 There are so many beaches to choose from, and even though it is winter here, it seems like there is never winter weather on the Gold Coast. I have not seen a drop of rain these past two weeks and the weather has stayed fairly consistent with about 70 degree temperatures every day. I live in a little area called Southport, and in the southern part of the suburb close to Ashmore. It takes me about 5 minutes to walk fast from my shared home to the Cities Research Institute, where I work. Everyone here keeps telling me how smart of a planner I am for getting a place so close to work, but it was sheer luck that I was able to secure a room in a rental house several blocks from campus. 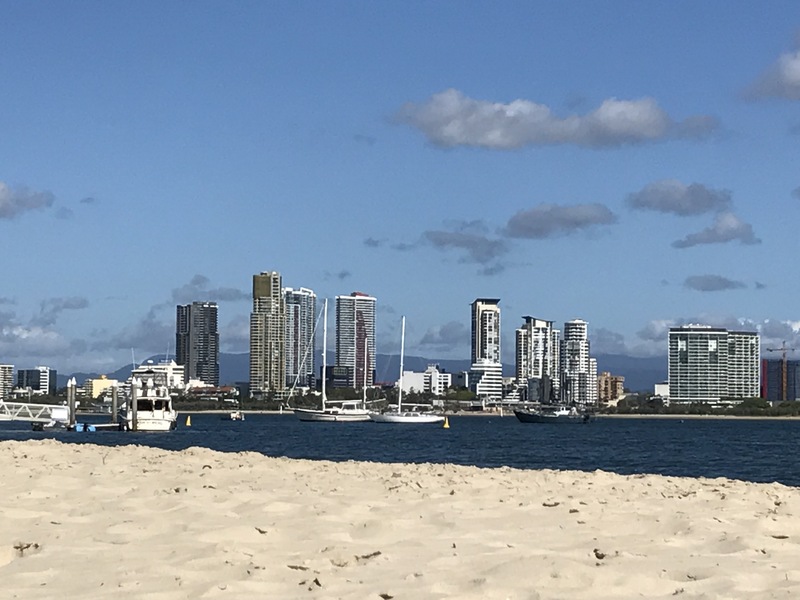 My first weekend at the Gold Coast, I was able to go to several different beach areas. I could not come to the Gold Coast and not be a beach bum at some point. Especially since I am missing most of the summer in the U.S., I need to soak up the sun and moderate warmth here as much as possible. One of my housemates showed me around town and where some of her favorite beach spots are. The first area we went to was Burleigh Heads. I felt like I had been transported back to a 1960s beachside town in the Pacific Northwest. There are a lot of hippy stores with tie-dye skirts as well as smoothie and juice bars. The beach itself is free of built up skyscrapers and is lined by tall conifers. The ocean is so blue and clear, which is a departure from the murky Atlantic Ocean. 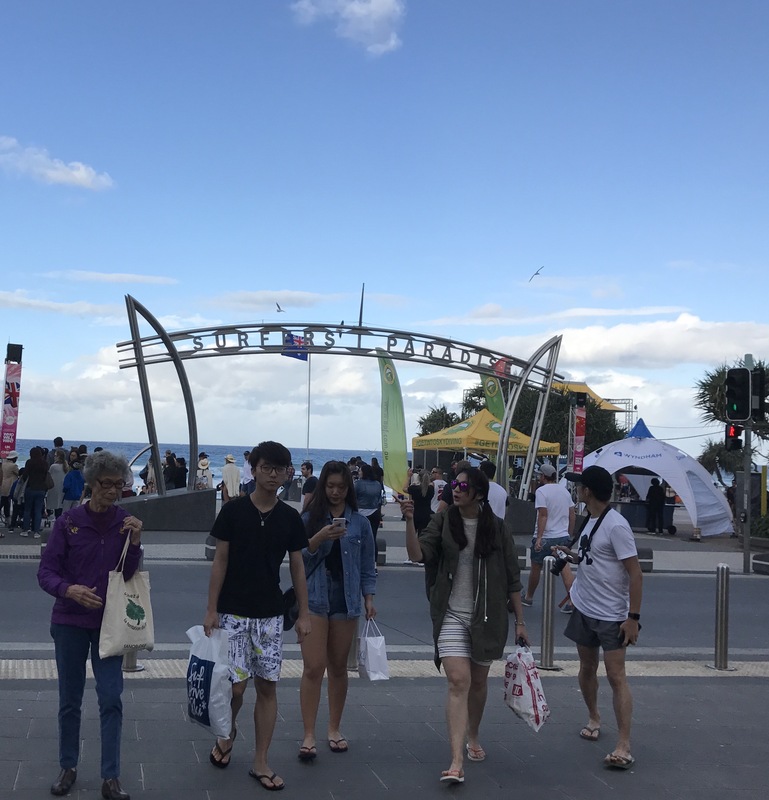 We then headed to Surfers Paradise, arguably the most famous beach on the Gold Coast, for dinner and to see a huge yearly fireworks show. Surfers Paradise is definitely a more urban beach with skyscrapers, fast food chains and tourist shops. 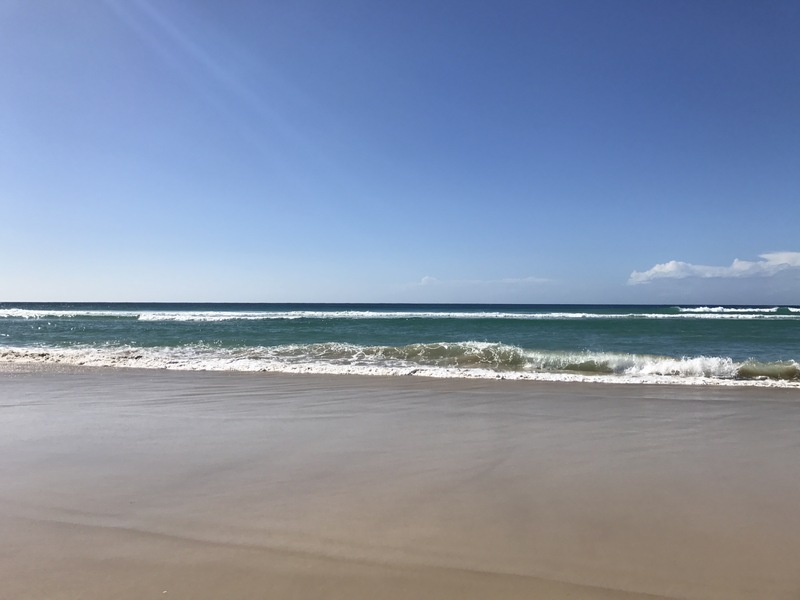 When I go to the beach, I like to be calm and away from all of the hubbub, so Surfers Paradise was not necessarily my taste, but it was neat to finally see this famous beach. My first Sunday on the Gold Coast was spent laying out in the sun and enjoying the beach. My housemate took me to a lesser known beach area along one of the canals around Surfers Paradise called Bums Bay at the Spit. You wouldn’t know that there was a beach behind the trees when you park on the side of the road. However, as soon as we took a brief walk through the bushes, there was a little sandy strip along a canal that fed into the yacht club at the Gold Coast. You could see Surfers Paradise in the close distance, but we were far enough away from the crowds. It was so peaceful laying out on the sand with a few families scattered along the beach and small yachts and boats floating out in the water. Laying there, I thought that this was the Gold Coast I had come to see and experience. I was not disappointed with my beach day. You may be asking at this point: “Does she spend every day at the beach?” Unfortunately, no. 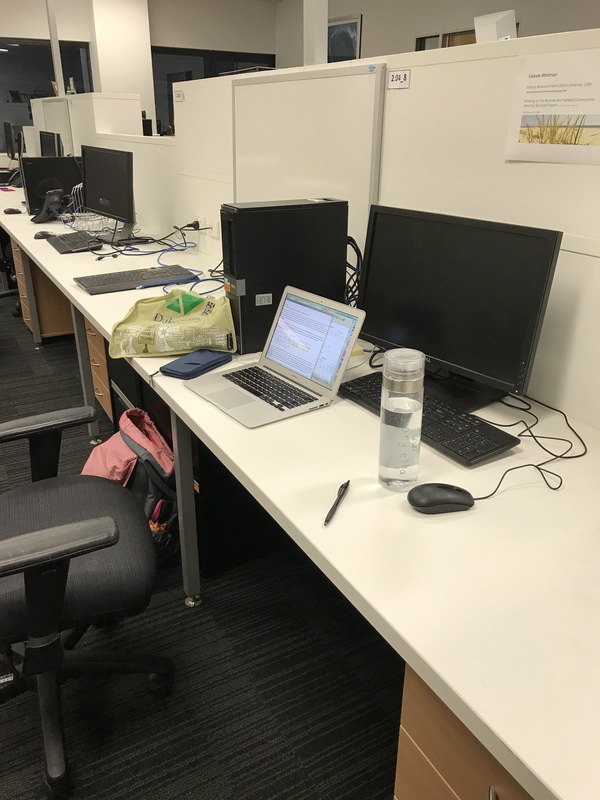 I came to Australia to work as a research intern on a project called the Remote and Isolated Communities Essential Services Project (RICES), where I am working with several people at Griffith University, the University of Queensland, various government departments and industry partners. Most of my time so far has been spent in an office running various statistics tests. While looking at a lot of data in SPSS may not be super exciting, RICES is a very cool and important project for Aboriginal and/or Torres Strait Island communities as well as the Australian government. RICES was initiated in response to inadequacies of water services for and communication with Aboriginal and/or Torres Strait Island communities. Remote and isolated Indigenous communities in Australia use an extremely large amount of water per capita in comparison to urbanized Australian areas. The daily average of water use per household in Australia is about 238 gallons. In the RICES’ partner communities, households used an average of between 261 gallons and 1,637 gallons per day. At the top end of the spectrum, some households in these remote Indigenous communities used almost nine times the average urban Australian amount of daily water. If these communities hope to have water 24/7 and not completely exhaust their resources, something about their water consumption habits need to change. The project has partnered with three communities to understand the demands and drivers for water use to support healthier and more sustainable Indigenous communities and promote mutual engagement with local service providers. While addressing immediate needs of Aboriginal and/or Torres Strait Island communities, RICES will also assess long-term water usage, incorporating communication between the community and service providers, to create community-level solutions for service inadequacies and economic and environmental burdens on these communities. As a part of the project, I am helping to assess statistical drivers and barriers within the partner communities so that we can figure out the best communication strategy around water use. We are hoping to bring some of the results from the statistical tests into workshops with the three Aboriginal and/or Torres Strait Island communities in order to better understand behaviors and cultural/social reasons behind their massive water use. I will get to travel to one of the partner communities with my supervisors to talk with key stakeholders within the community and attempt to come up with realistic solutions to their water service and water usage issues. With luck, we can show the communities the impact their daily water usage is having on the community overall and can understand the solutions that would be best for the community members. Griffith seems to be located in such a beautiful area. What a fabulous place to serve as your home base for research. Thank you for taking us along! Looking forward to hearing about your upcoming meetings and work alongside Australia’s Indigenous peoples.